If you've been stuck with what to do or how to transform your basement, you need look no further. This book is full of wonderful and exciting ideas to whet your creative appetite. Whether you need a laundry room, a gym, a second living room, a guest room, play area, or an office, they're all here, and more. Great and inspiring color schemes, textures, and practical and functional ideas. Even if you don't get much light down there or have a moisture problem, they've come up with solutions. They also have ideas for building codes and planning regulations. They've thought of wall ideas, floor ideas, fabrics, colors, bathrooms, lighting, ceiling improvements, and much more. Not only will you be inspired, you'll be drooling over which of these gorgeous designs you can make your own. There are also floor plans and templates so that you can design your own basement. Personally, I could have moved into any one of their rooms I loved them so much. 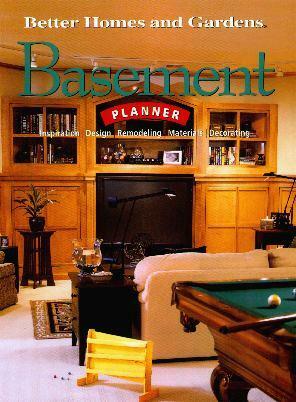 See my review on the other Better Homes and Gardens title, "Basements". Conclusion - A tremendously inspiring book with many tasteful ideas.